Every player in the basketball tournament puts all the efforts to get success in the tournament. Due to those efforts, every player should be encouraged. The purpose of the game should not be to appreciate the winners and discourage the losers. It is important to award certificate to all the players who have participated in the basketball tournament no matter how they performed. Organising sports in an institute develops the qualities of leadership and sportsmanship in the player. This also boosts the confidence in the player, so he can prepare himself for the next sports event. What are the major components of basketball certificate? If the player has done something extraordinary in the tournament, he should be awarded for showing the best performance. The details are not fixed in the certificate. You can add or remove according to your choice. What are the benefits of awarding basketball certificate? Basketball certificates are very beneficial for the players as they boost their confidence and make them feel more valued. 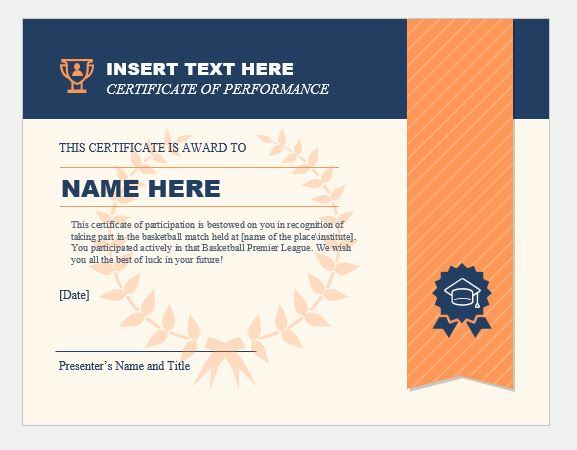 Basketball certificate template is available in several designs and styles. You can choose any one of them that you think is more suitable for you. These templates allow the user to edit details in them according to his needs. The user can also add the photograph of the recipient to make the certificate standout. The purpose of the template for basketball certificate is to provide maximum ease to the user with which he can design a certificate for his institute. 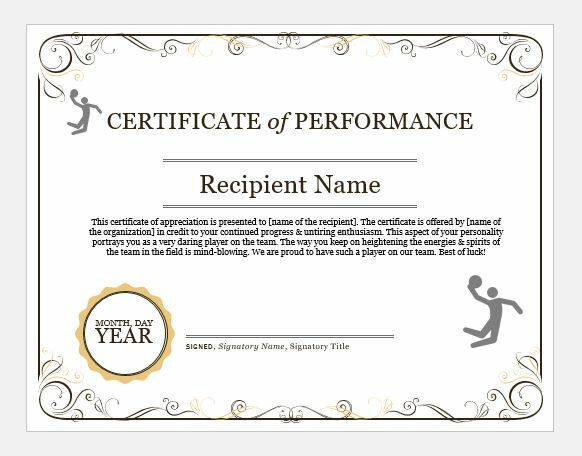 This basketball certificate of Sportsmanship is conferred to [name of the recipient] in appreciation for startling sportsmanship. You performed really well & kept the whole team in a high morale by boosting them up in one way or the other. Keep up with the great values. Congratulations! This certificate of appreciation is presented to [name of the recipient]. The certificate is offered by [name of the organization] in credit to your continued progress & untiring enthusiasm. This aspect of your personality portrays you as a very daring player on the team. The way you keep on heightening the energies & spirits of the team in the field is mind-blowing. We are proud to have such a player on our team. Best of luck! This certificate of participation is bestowed on you in recognition of taking part in the basketball match held at [name of the place\institute]. You participated actively in that Basketball Premier League. We wish you all the best of luck in your future! The certificate of most valuable player is bestowed upon you in recognition of your hard work & making a dent on the score of the other team. You were efficiently well in this match & gave your best in order to make your team win the match & finally succeeded in your great purpose. Undoubtedly, this victory is a teamwork but you were the active force behind this great success. We thank you for staying such an inordinate motivation for the whole team. Congratulations on your gaudy conquest!